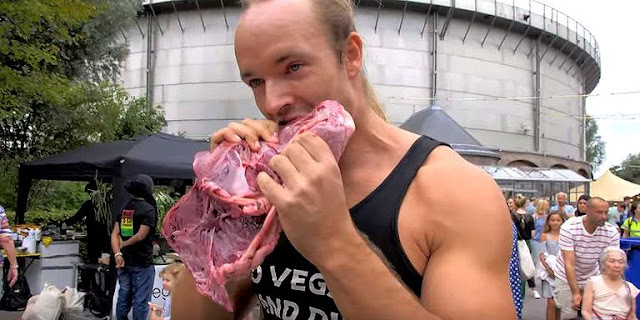 A meat-loving inciter stirred up passersby at a vegan food festival by eating a raw veal heart while wearing a shirt that says "Go vegan and die." Isn't it nice when opposing sides can come together and share ideas in a measured, non-threatening manner? 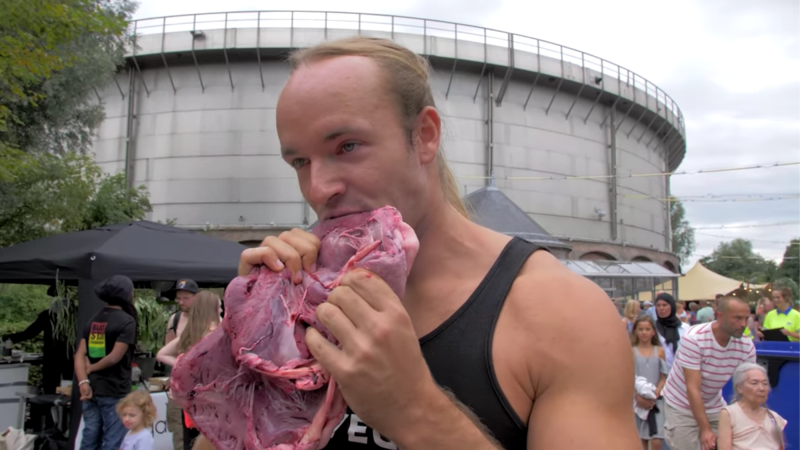 According to a spokesperson for the festival, the dude kicked off his bizarre, pro-meat protest in the middle of an event for kids—because apparently all the kids with fully-formed opinions on factory farming or whatever needed to be taught a lesson. Soon a few participants complained to the cops, and the guy wound up getting questioned by the police while he eat his hunk of dead animal. "It ruined our health," the man says at one point when questioned about his protest. "I was vegan and almost died. They're making everybody sick." YouTube user sv3rige's now-viral video has racked up nearly 375,000 views. In its description, he wrote, "vegans are malnourished" and "they hate nature." Police eventually confronted sv3rige after receiving numerous complaints from attendees, but no arrests were made. “While it is of course not forbidden to eat raw meat, it was of course a shocking sight because there was a puddle of blood and fat,” the festival spokesperson said.